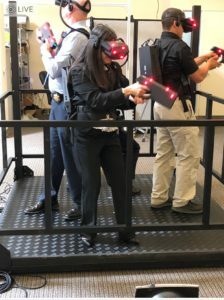 The San Leandro Police Department (SLPD) is collaborating with local virtual reality developer PhaseSpace to see if Department of Defense (DOD) developed technology can help Police, Fire, and First Responder training. Headquartered at the Gate 510 for the past 18 years, PhaseSpace develops motion capture solutions for academic and medical research, training simulations, and the robotics, graphic arts and entertainment industries. Meet PhaseSpace Founder and CEO, Tracy McSheery, and see their technology in action in this video (see minute 9:45). 10 years ago, PhaseSpace developed training tools for the US Navy and Marine Corps under a Small Business Innovative Research Grant. Partnerships with Berkeley, Stanford, MIT, USC and other research institutions gave PhaseSpace experience in virtual reality (VR) long before it became widely available. PhaseSpace is now developing software with the intent of creating a VR training environment for law enforcement training, creating dangerous situations to hone police skills in a virtual environment, saving costs of travel and training. Over the course of the past year, the SLPD has collaborated with PhaseSpace on the development of the software by testing it and providing constructive feedback. The significance of this public-private partnership is not to be underestimated. PhaseSpace has made leaps and bounds since its original iteration, creating environments that would traditionally carry a high liability. At present, the program addresses numerous stressful aspects of Police training, including de-escalation of tense circumstances, active shooter situations, and extreme driving scenarios. The VR environment is very realistic, which makes the training experience that much more impactful. Furthermore, PhaseSpace has consulted with mental health professionals in an effort to address the psychological consequences of these situations, such as Post-Traumatic Stress Disorder, and incorporates unique methods to help minimize trauma. SLPD continues to test the program and to consult with PhaseSpace on further improvements. The most significant take-away is that PhaseSpace has been able to create a program that places officers in very realistic training scenarios and enables a highly effective learning environment without the risk of real-world damage or injury. While still in development, the product is nearing an iteration ready for introduction to the Police Officer Standards and Training (POST) Commission. In the event of an endorsement from POST, it is conceivable that the program will be implemented statewide. It is incredible to witness something so game-changing being developed right here in San Leandro. This software is of potential statewide, and even nationwide significance, and goes to show that great things are continuing to be made in San Leandro.